A few weekends ago, I had a chance to play Street Fighter IV at a friend's house. Had I been wearing socks while playing, those socks would in fact have been knocked off. I'm going to be honest with you... this one didn't turn out terribly well. The perspective was supposed to be much more forced and dramatic, but I have this problem where apparently my brain strives desperately for mediocrity, and while drawing, I unconsciously make things moderate and boring instead of extreme and dynamic. Regardless, it's nice to draw a character like Ryu every now and then--he's very recognizable in spite of being so visually plain. Those factors make me feel comfortable drawing him from a rare rear view, because I don't feel like we're missing any interesting costume details from this angle, and I'm also confident that he'll still be indentifiable. 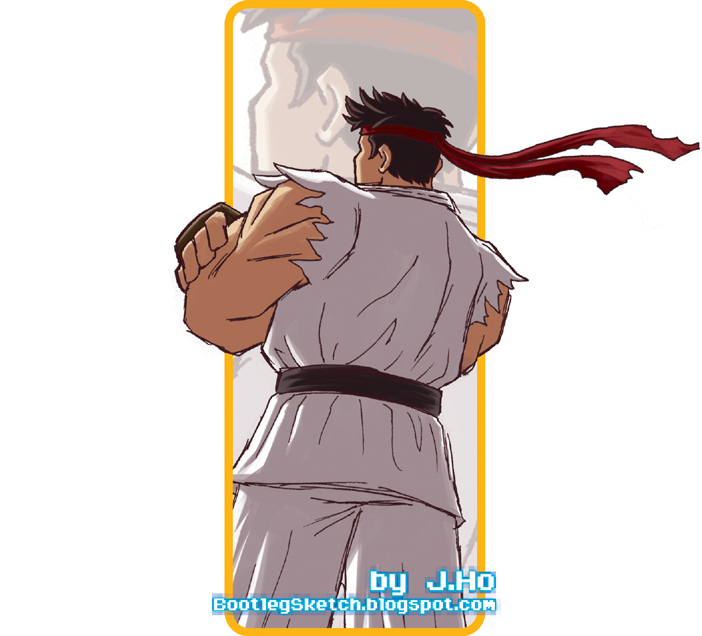 I thought that showing Ryu's back turned helped emphasize his aloof demeanor. Likewise, I tried creating poses-reflecting-disposition in the other Street Fighter pieces I drew... which will be flooding this blog shortly. Stay tuned!